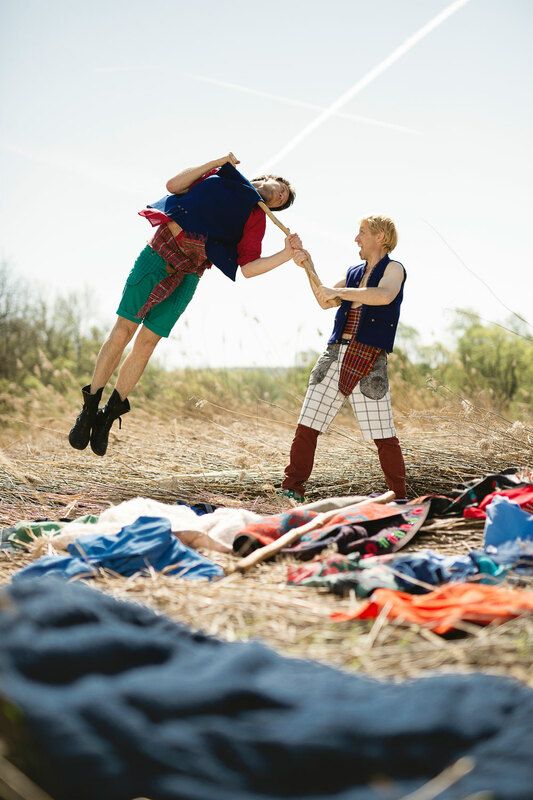 Gábor and József have an acute ability to analyse and reinvent traditional dance. The starting point for Creature are the accessories used in dances including sticks, whips, mask and costumes. The process is to deconstruct and recycle the traditional dances and accessories with a view to make it relevant to the audience of today. There's something wonderful about taking something that has already been used, ready to be thrown away, deconstructing and reconstructing it to serve a new purpose. It's not about fixing it, but making it function in a new context, giving it a different life. In their choreographic process Gábor and József commandeer the folklore to produce their own “fakelore” thus inventing an updated Creature. Funding : Département de la Culture of the City of Geneva, Prohelvetia, Loterie Romande, Schweizerische Interpretengenossenschaft SIG, Commune de Lancy. Co-production and residency : ADC / association pour la danse contemporaine, ADC Studios,Genève CH; Le CND, un centre d’art pour la danse, Pantin FR; Arsenic – centre d’art scénique contemporain - Lausanne CH; Kaserne Basel CH; CCN - Ballet de Lorraine, Nancy FR; Migrations, Pays de Galles UK. Residency : la Briqueterie CDC du Val-de-Marne FR; Tanzhaus Zurich CH. Other partners : MEG Musée d'Ethnographie de Genève, CH; CCN Rillieux-la-Pape – director Yuval Pick, FR, Label Bobine Genève. A project in cooperation with the adc - Genève, ADN Neuchâtel, Arsenic Lausanne, Dampfzentrale Bern, éviDanse, Kaserne Basel, Festival Antigel Geneva and Zürcher Theater Spektakel Zürich, in the frame work of fonds des programmateurs / Reso - Réseau Danse Switzerland. With the financial assistance of Pro Helvetia, Ernst Göhner Stiftung.